Nissan and Mitsubishi will introduce four new minivehicles in Japan through their joint venture, as the companies continue to expand their collaboration. Production of the all-new Nissan Dayz, Nissan Dayz Highway Star, Mitsubishi eK wagon and Mitsubishi eK X began at Mitsubishi's Mizushima Plant in Kurashiki, Japan. For the first time, the models will be offered with semiautonomous driving technology, designed for single-lane use on highways. 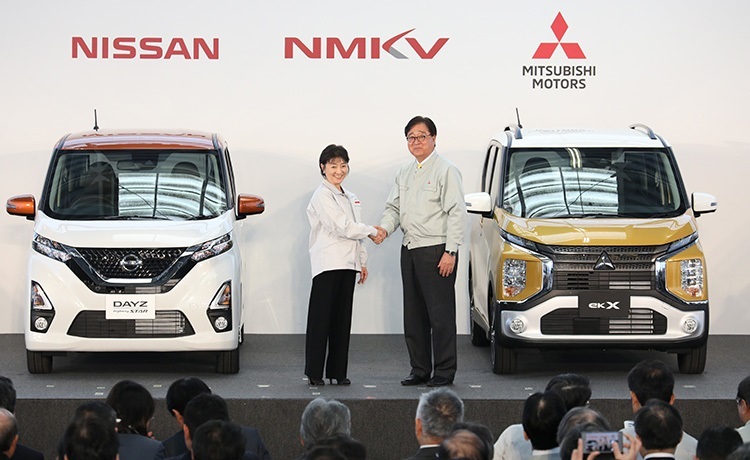 NMKV, a joint venture of the two companies, integrated Nissan's advanced technologies and Mitsubishi's extensive experience in minivehicle production into the light, tall wagon-type cars. The companies launched the first generation of the models in 2013 and have increased their collaboration since becoming alliance partners in 2016. Last month, the all-new Nissan Livina, which shares a platform with the Mitsubishi Xpander, went on sale in Indonesia. The new models deliver a markedly improved performance, with upgraded platforms, engines and transmissions. They also feature all-new design. While the Nissan and Mitsubishi minivehicles share key components, they retain separate brand features. The models will go on sale later this month.